Moje’kJoe Papapaah felt like deserting the bridge for a while: It would be a while before the Jotmaster and the apprentice return from their expedition of the current textual chain. Moments earlier when he checked the monitor all was well with them within the tex-Ah-verse. And outside of the cockpit he observed that the alpha numerical belts were stable as the hover craft cruised smoothly. It could be an hour or so before they crack the current code. At any rate the Jotmaster preferred to move cautiously in these matters, preferring to savour every detail of the pseudo reality erected by the alphanumerical belts. While the two were gone this could be the opportunity to indulge in his own fancies, a trip involving art. He looked at his smart chronograph strapped on his left wrist. With a long press at the centre of the digital dial the rectangular screen was pervaded by a vibgyor spectrum after it disperse the arms. He mimicked the number 1-9-4-0-, and an inflection ’ chasing – S.
This is the final edition of an essay that I first published on 23 May, there have been a few omissions and additions made here and there, all done with the effort to zoom clearly on the preoccupation the essay raises. The original work is still available in this blog. I was going to title the present article artwork. That title would not have encapsulated the issues that I would like to tackle presently. In a country that is divided economically and operating along racial lines, though covertly, when one looks at the so call liberal arts, even before consider such art as liberal, we must go to the beginning of the conception of an artwork which is in itself a problematic journey in itself. Yet its locale is quite clear, the conception of an artwork takes place within the exercising of freedom to respond to stimuli either internally or externally to the artist not from freedom of speech. Actually freedom of speech is the desire to share with everyone around you your fundamental concerns. I was going to title the present article artwork. That title would not have encapsulated the issues that I would like to tackle presently. In a country that is divided economically as well as operating along racial lines when one looks at the so call liberal arts, even before we consider such art liberal, we must go to the beginning of the conception of an artwork which is in itself a problematic journey. Yet its locale is quite clear, the conception of an artwork takes place within the exercising of freedom to respond to stimuli either internally or externally to the artist. It is a privilege for one who has not dedicated one’s self to the pursuit of art practice, one who gathers joy in its consumption through the activity of looking to be afforded the opportunity to be familiar with those who are engaged in the production of the visual art object. Visual Art Production like any other art form attains its full expression as a unique form of individualistic artistic expression now and then when a new talent emerges. It is a duty of those involved in its pursuit of visual art practice to unveil a new artistic language unique to their production in order that they are discernible from the multitudes of other artists. An artist achievement is unquestionable when, through hard work and prolonged search for individuality, arrive at a new artistic language to communicate ideas. The triumph of an artist is in two respects. First, the artist must contend with their context in their pursuit of their chosen vocation this context differs from artist to artist. Secondly the artists must go through the rigors of mastering their chosen media. With these two aspects conquered only then will the artist settle on a journey of self discovery and invention. These two aspects are here stated in their successive nature: first self discovery and second, invention. In their further elaboration: self discovery is attainable at that juncture when an artists fully embraces their vocation as creative participants in the visual arts and invention will stem from that point in their career when they stumble, more often through trial and error and seldom through luck, at what will be their formal language in art – their unique style. But before we swing wide we must retain and address context and media. Introduced at the first few lines of the present paragraph, context within which artists practice differs from artist to artist. More often it is financial circumstances that must be transcended in order to establish practice. With regard to the mastering of the chosen vehicle to deliver the message, or simply put medium, the artist must learn to acknowledge the artistic approaches laid down before him by his predecessors through Art History; blessed are those who learn directly from the master. Having gathered what is essential from the fountain of art practice, the master that is, the artist through time emerges and charts a unique route of their own. In the long run, through commitment and perseverance the artist will acquire his or her rightful place in the History of Art. Portraiture is one of the most important genres in western art history in that through it great figures in history were captured.The aim of this essay is to view four Dada portraits in terms of how they show 1. Sociopolitical realities 2. Gender Expectations’ codes of convention and 3. The role of spectator. The artworks that this essay will discuss have been produced between 1915 – 1920. When we look at this work we are confronted by an arrangement of organic shapes, one on top of the other building the composition of the work. There is no reference to the human face. However we are drawn to the medium itself and how it has been manipulated to depict Tristan Tzara (1886 – 1963). According to Richard Huelsenbeck, Tristan Tzara was one of the Zurich artist members who founded Dada in 1916. Hugo Ball, Hans (Jean) Arp (1887 – 1966), and Marcel Janco ( 1895 – 1985 ) were the other members of this group (see Chipp, HB. 1968: 377). According to Tristan Tzara ‘In art, Dada reduces everything to an initial simplicity, growing always more relative. It mingles its caprices with the chaotic wind of creation and barbaric dances of savage tribes (Chipp 1968: 386). This is indeed true of figure 1. The composition is simple and it looks like anyone who is not an artist might have produced the artwork. The key word here is ‘nature’. 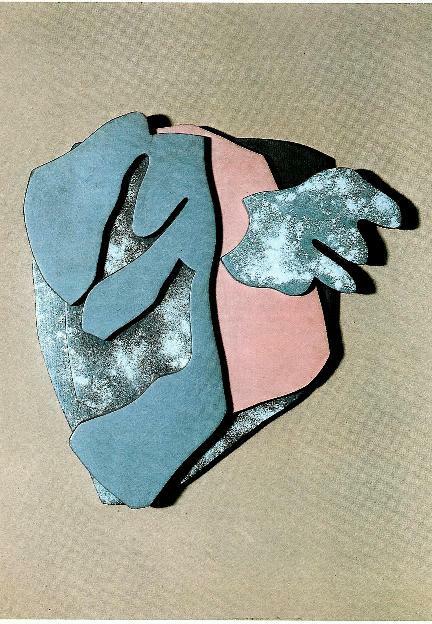 In the Portrait of Tristan Tzara the shapes which represent Tristan Tzara recall forms which can be liken to algae, rock formation or even plant leaves. Observe the gaping shape towards the right. If we bring one of the questions raised at the outset of this essay, the one that concern socio political references I think that the work is devoid of such references, it is rather a personal account. It is a personal account in that, though its title alludes to an important figure in the Dada movement’ it is an abstract rendition of its subject matter or, to use Arp’s term, it is Concrete. One cannot easily make out the image that the work is depicting, it is the title of the artwork that affords the viewer the opportunity to fathom that it is a portrait and also the viewer’s schooling in modern art movements can afford the ability to make the connection as to who Tzara is. The portrait then, as unrealistic as it is, terms of abstract art, which strives to save, free man and simplify his life, it represents Tristan Tzara. This artwork which was conceived during World War I is devoid of gender expectations. The role of the spectator is to ponder what the work is trying to show. The spectator is propelled towards a deeper questioning of what art should be and the form it should take especially bearing in mind the western tradition of art making. Chipp points out that Dada was an attempt to free the artist from traditional views of the arts to form a conception of art as a moral and social phenomenon (1968: 380). My favorite exhibition in Tshwane/Pretoria is opening very soon, SASOL New Signatures Art Competition. This exhibition represents an avenue through which an artist’ career can be launched. Unfortunately what is sad about the exhibition is accessibility to a wider participation of artists residing in the periphery of the City of Tshwane (and I suppose elsewhere). By this I mean artists residing in the far away localities who may not be able to easily access information regarding the exhibition. The coordinators of the exhibition are well aware of this fact and have taken steps to curb the problems of accessibility to the art competition by staging briefings and discussions in the peripheral communities. In real time and space. always the challenge of space in the communities and the unreliability of the community artists to receive this gesture. Thus because of lack of contact the artists who reside in the peripheral communities remain uninformed about the aim of this art competition and the nature of artworks that may be entered into the competition. There exist a mis- communication between the center and the periphery and the results is that of work of a disappointing nature been ferried to the art competition only to be thwarted out because contextually they do not fit within the paradigm that SASOL New Signatures upholds – which is conceptual art. An exhibition’s core aim, never mind the content of the artworks, is to bring a body of work, executed by different or the same artist, into one space and create a dialogue between the artworks – this is also subordinate to the content of the work forming the exhibition; meaning the vision of what the overall feel of the exhibition should be is a huddle that must be negotiated by the artworks to be entered into the competition. At a heightened level it is the artists who are in dialogue with one another through their artworks. Let us meditate on the word dialogue. Dialogue constitutes a conversation. It cannot be overstated that those in a dialogue should share a common language. And this is precisely what is missing in those artworks that are rejected from an exhibition, they do not contribute to the erected paradigm of the art competition, they do not accentuate the ideals of what the exhibition is about. Do we have to care to reverse this misunderstanding that these aspirant artists suffer? The answer is emphatically yes. It is a question of erecting an infrastructure that that can regulate the vision of the art competition. That is if the ideal of the competition is also to educate the artists and the society about the movement that visual art finds itself evolving into. What do I mean by this? In order to get to the meaning of my feeble statement I shall retreat a little bit backwards into the genesis of the visual art practitioner to be. This genesis is in two modes. The privilege mode and the under privilege mode. My reader should not misunderstand me here, when I talk about privilege artist I speak about that artist who has had the opportunity to study art at a higher institution of learning after matriculation, this artist is gifted, this artist has a vision to be a practicing artist and through the appropriate pedagogy this artist ascend into that dimension in which the western and global conventions of what constitutes visual art make sense to him both when reaching backwards into the history of the visual arts as well as firmly standing in the present tense looking at what is going on around him as far as contemporary art is concerned and simultaneously projecting the possibilities of the nature that the visual art as an ever evolving organism. This type of an artist confidently contributes into that future nature of art that will be called contemporary2. It is utterly simple then to situate the underprivileged artist. He/she will represent the opposite of what I have just said about the privilege artists. And it is at him that much work should be done in order that he/she can comply with the status quo. It is in this locality where the talk shops and the workshops in the communities are in demand. It is here that we can learn what developments are taking place when there is interaction with the ‘community based artist’1. It is here that real developments from the sponsor of an art competition I much needed. The art organizations and associations based in the communities must take steps also so that they can meet the opportunity halfway. This is not only an opportunity to be informed about an art competition which promises a five digit sum but it is also an educational opportunity for the artists since issues of presentation of artworks can be covered in an interactive process until all conceives the exact intention of the art competition. Then there can also be networking for other opportunities in order to further develop the artist and negotiate the underprivileged mode of genesis of the artist into a better level. But this is not the only solution, it is only a part of it. Within the formal educational system in South Africa both at the tertiary level and the secondary level the nature of art should be exhausted holistically in order to foster dedication, professionalism and confidence in the aspiring artist. Here those who are in power to assimilate information must do so in a efficient, sensible and responsible manner. It is only when we face these facts that in time we will begin to see the glimmer of an infrastructure ,accommodating on an equal footing, formal art students as well as informally trained artists lacking formal education in the visual arts. May I reiterate? This can only happen when we acknowledge the challenge. The challenge is that those who are in power (the educated classes and the those for whom art represent a commodity) of the nature of the status quo must acknowledge that by inserting an opportunity of an art competition, with arguments for it as a developmental modal for promotion of a virtually unknown artist are contributing to the development of the contemporary artist through monetary award and The fact that there is money at stake gets everybody’s ears pricked. It is the latter that mislead mostly, henceforth rigorous information assimilation and regulation on either side of the sphere to create an equal footing so that the artist treats the prize as an opportunity for sustenance and further development in their quest to forge careers as visual art practitioner. Like I said I always look forward to SASOL, it is full of surprises. Last year’s runner up’s work was interesting in that what the artist did was simple. 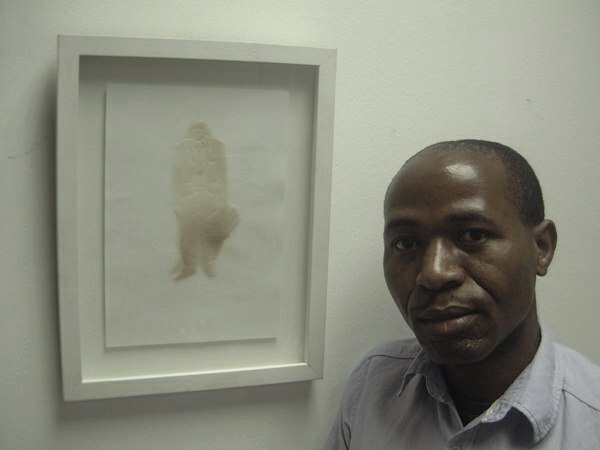 The artist Nare Mokgotho loaned the work that won 2007 overall winner and subverted it by presenting the work again in the 2008 exhibition with him as a collaborator thus questioning the nature of originality of the conception of the artwork bringing into scrutiny ownership. He initially radically wanted to claim co-authorship with all artworks that made it to the final selection however he was limited to the 2007 piece which SASOL owns due to the non compliance of the finalist artists, which is understandable. Here we see that this artist was operating within the present tense and was able to interrogate the status quo of what constitutes conceptual art in terms of SASOL New Signature. From a structuralist perspective Mokgotho achieved a dialogue between the conception of what constitutes contemporary art in the context of conceptual art and the 2007 judges’ choice of what they saw as a conceptually loaded artwork representing contemporary art. It is this critical thinking that must be naturalized in the aspiring artist aiming to practice within the conceptual art paradigm. This is what we need to grasp in order tackle visual art development never mind the institution or informal structures we belong to if we please to reach goal. We must have interaction between the center and the periphery. SASOL New Signatures opens on 26 August at the Pretoria Art Museum. 1. The idea of a community based artist can be regarded as derogatory in that it perpetuates the myth of separation of communities based on binary opposition which in essence does not exists because the so called community artist opposes the equilibrium of such a notion when they dislodge themselves from their communities and enter into the centre/art gallery/art museum/art competition and their work is accessed by the external community foreign to their immediate realm. 2. Let us keep in mind that the word contemporary is subordinate to the context of the speaker, it is a shifting phenomenon.